The strong sense of family support is rooted in his upbringing. 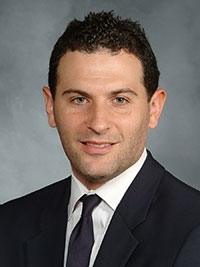 Raised in South Orange, New Jersey, Dr. Knopman grew up with parents who stressed strong family ties and a good education. “They made their own personal sacrifices for my education,” he says, and he values that now more than ever. Dr. Knopman became interested in philosophy as he grew up, and he chose it as his major when he enrolled at Northwestern University in Evanston, Illinois. In his first year of college Dr. Knopman dug more deeply into philosophy, with the key question of “What makes us human?” He found a mentor in one of his lab professors, saying, “He taught me how to think critically. He really made me think about the inner workings of the brain and how it affects our actions.” After some reflection and taking some neurobiology courses, Dr. Knopman switched majors. “Neurobiology answered the questions I had about the human condition better than philosophy did,” he remembers. With his neurobiology degree in hand, Dr. Knopman headed back east to New York City to attend medical school at Mt. Sinai, followed by neurosurgery residency at Weill Cornell and NewYork-Presbyterian. In addition to his valued faculty mentors, he credits his fellow residents for really training him to be a doctor. He reflects fondly, “You spend more time with these people than your family. You learn from the more senior people. When it’s three in the morning and the only people around are your co-residents… it’s like fighting a war together.” He remembers his senior resident being the one who gave him a new perspective on his work and who helped complete his metamorphosis into a full-fledged doctor. 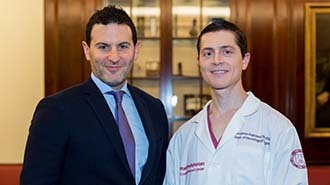 He realized his next steps with the help of another mentor: Dr. Philip Stieg—the chairman of the Weill Cornell Medicine Brain and Spine Center. “He challenged me to upend traditions and develop new techniques—all in the name of advancing better treatment to patients,” says Dr. Knopman. Dr. Stieg supported Dr. Knopman’s belief that the biggest impact could be made in a fast-growing field: interventional neurosurgery. Drawing on skills from radiology as well as neurosurgery, interventional neuroradiology was taking off as a way to perform minimally invasive versions of previously open surgical procedures. The results of that mentorship are now clear in his pioneering, minimally invasive surgery for subdural hematoma—a condition that previously required open surgery.